Hello crafting friends! Surprise, surprise....just when you thought I would not make it back to the crafting world. I have so missed stamping and creating! I plan to set aside some "me" time to create a couple of projects per week. I am so far behind on scrapbooking, that it is really scary! Not to mention that Christmas is fast approaching and Christmas cards will make it out this year! 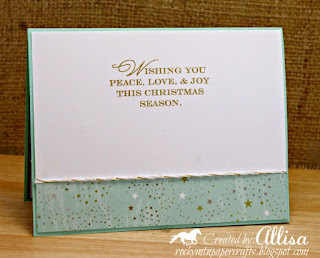 I bring you card number 1, created with fun new products from the Close To My Heart Holiday Expressions catalog and based on the sketch challenge this week at Freshly Made Sketches. Thanks so much for stopping by! Your continued support over the years means alot to me! So thankful to be a part of the crafting community. 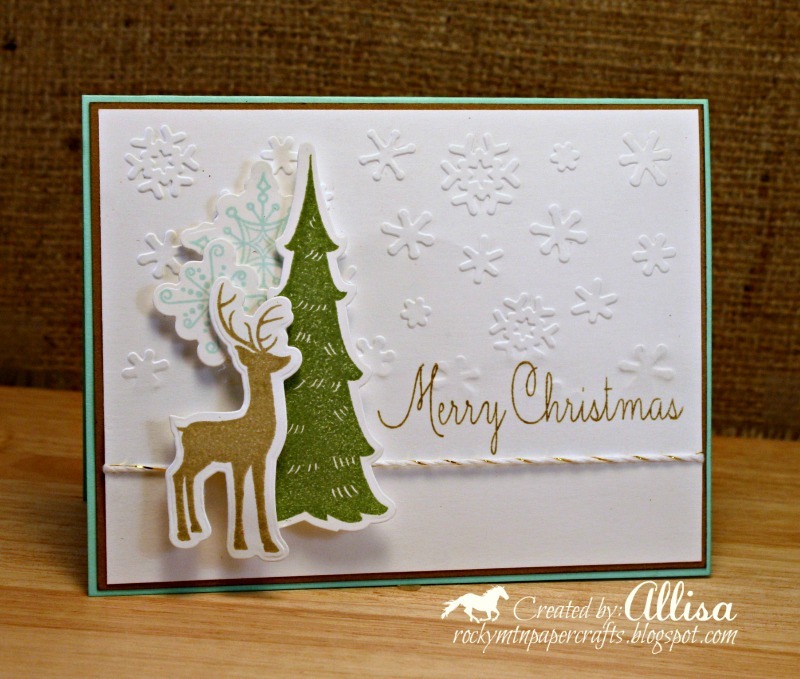 I really like your card, Allisa - sweet combination of elements and love the soft colors! Thanks for playing with us at the Simon Says Stamp Wednesday challenge! I was so excited to see you posting again! Your pretty card popped right out of the FMS gallery! Good to see you stamping again! So glad to see you stamping again, and it looks like you jumped right back in where you left off -- no rusty stamping for you! And I'm so glad to see you in the gallery at FMS! So glad to hear you will be getting back into crafting. I'm sure your supplies have missed you! I love your Christmas card - the images are classic! So good to see you back! Looking forward to seeing and being inspired by more of your work. Thanks for playing with our Watercooler Wednesday Tic Tac Toe Challenge. What a great sketch and combination of elements you chose. This is a really pretty Christmas card Allisa. Glad you're back into paper crafting. 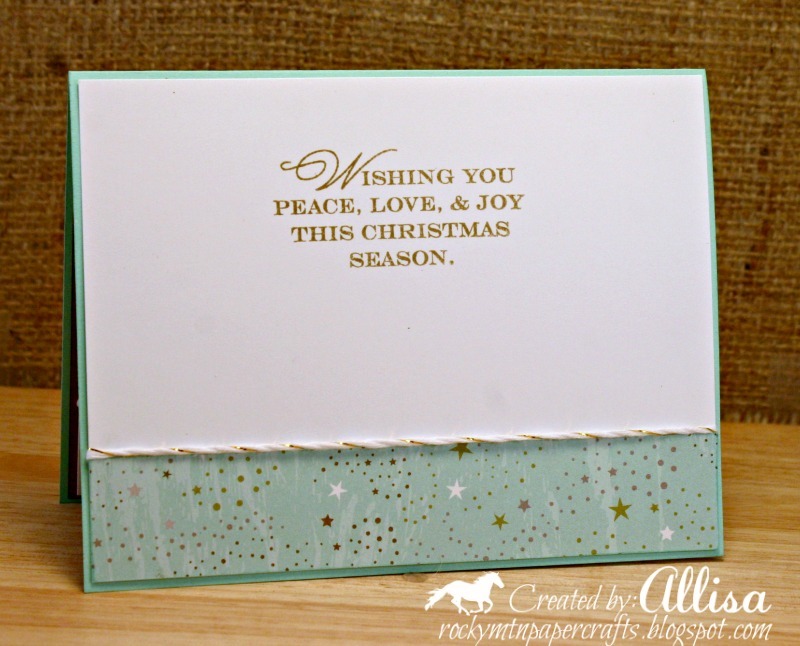 Hi Alisa, what a wonderful card you've created by combining the two challenges. 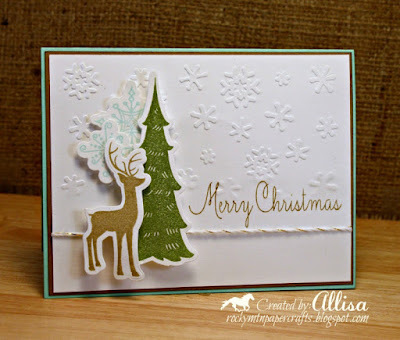 Love the way the tree and deer stand out so nicely against that beautifully embossed background. Setting aside "me" time is important for your mental health. Kudos to you for deciding to give that to yourself. Thanks so much for joining our Watercooler Wednesday challenge this week. So glad to see you back and taking time for YOU.. enjoying what you love to do and doing what you love to do is so important! I've always loved your simple yet elegant cards.. you have a certain style that I love and I have saved many of your cards to my "wish list" of cards to make! I'm looking forward to your Christmas cards this year to inspire me. Wonderful card, Alisa. You combined the two challenges together perfectly. Thanks for joining us this week at Watercooler Wednesday Challenges. Quite a sweet card you created! Love it! Thanks for joining us at Watercooler Wednesday this week. Beautiful card Allisa. All of my favorite elements for the upcoming season. Deer,snow and trees. So very peaceful. Good plan for the "me" time too. Thanks for sharing your inspiring creativity with the Watercooler Wednesday Challenge. I'm so glad you're back! I've missed your gorgeous creations! This card is super stunning and so very striking! Love the images you've used and the textured background is a fab addition. Thanks for joining us at FMS!